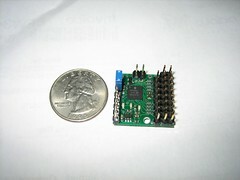 And here is the Pololu Micro Serial Servo Controller. It is an 8-channel servo controller driven with RS-232 or TTL serial. It is small! Could I write a 5-channel servo controller on the SBC65EC board? Probably yes, but since the Pololu controller only cost $20, it isn't worth me spending the 10 hours it would take to write the servo controller and make it work well and play nice with the TCP/IP stack. Unfortunately the SBC65EC does not expose all of the PIC18F6627 PWM outputs, so I'd have to do the PWMing myself. My friend Scott Hutchison was featured in May's Elan Magazine. The article mentions the work Look that we collaborated on. UpDATE^3: I FINALLY got the RVHE working with a two-way NATed UDP conversation with a host over the Internet. Well, OK, it seems to work half the time, it is unclear to me if this is an issue related to NAT or not, hopefully I can do some Etherealing tonight to double check. This kind of annoys me, because it means Touch won't be automagically plug-and-play without hooking up a serial connected terminal and setting the gateway IP and MAC. But at least I can prototype with it. AND: The RVHE initially sets the UDP time-to-live (TTL) value to zero. This means if your packet will be dropped by the first router it hits. Undocumented, it turns out the TTL is set by the byte at the packet header address plus 10 bytes. However, too high a TTL will break the packet header checksum routine (which also means your packets won't make it). So I suggest keeping the TTL at 70 (decimal) which should get you across the longest Internet connection, but doesn't appear to break the packet header checksum routine. Where the 70 is the TTL. AND: Let's not forget that the RVHE only receives UDP packets that start with the password in PASS0,PASS1,PASS2,PASS3, then "AB" (which is not documented). The password defaults to "RVHE". If instread you add "AA", it will only work with "autoanswer" (which is documented). Salon has an article on Natalie Jeremijenko, technological/environmental/public artist. Her website is here. Among other works, she has put together Feral Robotic Dogs that find poisons in brownfield sites. Now I feel like my fish are underachievers! The Washington, DC chapter of Dorkbot is forming, and the first organizational meeting is tonight (June 20, check link for more details). I'll be there tonight with an RVHE board to show off. So after a bit of work to understand the documentation, I finally have the RVHE boards sending and receiving UDP packets. Now for Touch, I need to build the server where they two sides will meet, and have them exchange A/D information, and drive the finger servos. I had a great time in Toronto, and much of it centered around the Interaccess electronic media center. I attended an opening of work associated with the Subtle Technologies conference. One of the sculptural works by Philip Beesley and Will Elsworthy looked like thousands of feathers tied together along with piano-wire tentacles. The tentacles were attached to touch sensors, and touching them pulled up the tentacles using memory wire. Another night I attended Dorkbot Toronto which included David McCallum's "Warbike" for sonification of wireless access points, a discussion VJ tools and techniques by VJ Nokami, and Cameron Browning's 3D network visualization glove. Finally, I attended an I/O Media synthesizer jam, which was far more entertaining than I thought it might be. Lots of combinations of analog and digital synthesizer systems. I found out about a lot of cool things, like FreeFrame video effect plug-ins for VJs, and Pure Data, a real-time dataflow language for audio and video processing, and the Plogue Bidule and Live5 audio systems. Today I found The Serializer at RoboticsConnection.Com. Based on serial control (full RS-232 or TTL levels), it has: I2C, 5 A/D, 2 4A DC H-bridges, Single and Quadrature Encoder inputs, 2 servo controls, up to 16 digital I/Os. 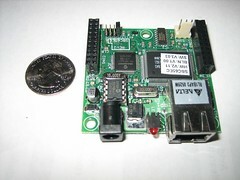 RoboticsConnection has a PC-104 PC, but it is $319!